Land Rover has unveiled its new Discovery Vision Concept, a car that features remote control via tablet, an 'invisible bonnet' as well as the ability to project a HUD down onto the ground in front of you. Unveiled ahead of the New York Auto Show the Discovery Vision is Land Rover's most advanced car yet showcasing just some of the new features that'll be heading to new Land Rover models in the next few years. 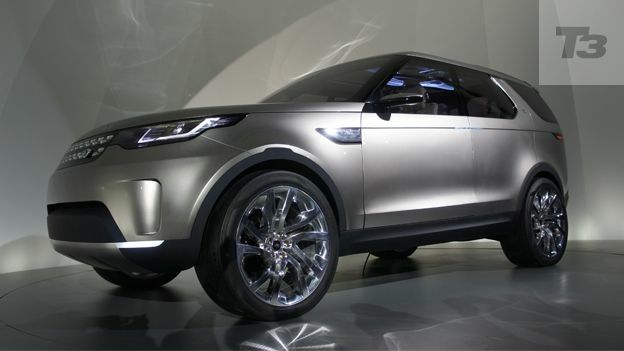 In fact the design will inform the 2015 launch of the Land Rover Discovery Sport for starters. Whilst it may look like your average concept car on the outside the Discovery has enough features to put even the eye-watching Samsung Galaxy S5 to shame. T3 went hands-on with Land Rover's most futuristic car ever made, check out our pick of the best gadgetry that features on the Discovery Vision Concept. Rather than open the door manually, like some caveman you simply wave your hand and the door will automatically open. Once inside the car you can adjust the tint of the windows simply by moving your arm up and down and even turn on the headlights by pointing out at the as-yet-unseen wonders you're obviously heading out to explore. Did we mention there's an 'invisible bonnet'? If we hadn't then listen up, because there's an 'invisible bonnet'. Land Rover's new Heads-Up Display technology can project what you'd see if the car had a see-through bonnet giving you that all important visibility when traversing mountains, fields or your local high street. The jet fighter inspired tech places tiny cameras on the underside of the car then projects that live feed up onto the windscreen giving the appearance that the bonnet has quite literally vanished. First seen on Audi's Quattro Sport Laserlight concept Land Rover has also decided to use laser diodes in conjuncton with state-of-the-art LED headlamps. The result is headlights which can see 300m with no loss of light over distance and thanks to high-definition cameras built into the lights the car can intelligently block light that's shining towards incoming traffic or pedestrians - keeping them in the shade whilst still lighting up the rest of the road. Yes, the new Discovery concept is remote controlled. Connected via smartphone or tablet through a WiFi hotspot created by the car you can remotely drive and steer at very low speeds, ideal for when you need to cross dangerous terrain that normally might put you as well as the car at risk. Or of course you could just use it to show off in petrol stations and the like. Laser Referencing projects images down onto the road creating your very own outdoor laser HUD. By using the high-definition cameras and terrain response sensors the car can sense barriers and challenging terrain, then project visible alerts and warnings down onto the road in front of you giving you a totally clear indication of just how much room you'll have or what type of terrain is coming up. Land Rover is keen to point out the technology has more mundane uses too, such as projecting an outline around a proposed parking space before manoeuvering. Ideal for bagging a spot in London.